Top Thrill Dragster, the roller coaster in Cedar Point, Sandusky, Ohio is one among the adventurous thrilling rides. This thrilling amusement ride was popular with its own acceleration, speed, height, and drop. And the most amazing fact is, the top thrill dragster runs with a hydraulic launch. The power density and precision made hydraulic launch suitable for this roller coaster. While considering the history, top thrill dragster was the second installation with a hydraulic launch followed by Xcelerator. 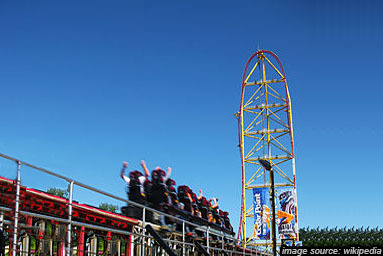 It was launched on May 1, 2003, in Cedar Point in Sandusky with a tag line "Race for the Sky". The German roller coaster designer Werner Stengel of Intamin Worldwide company builds this steel accelerator roller coaster. This 420-foot tall roller coaster has a speed of 120mph and the 90° ascent and descent on the 420-foot “top hat” tower is an important feature of this dragster. The top thrill dragster contains 6 trains with five cars and it can carry a total of 18 riders per train. This thrilling ride will take only 3.8 seconds to raise its speed from 0 to 120mph. The large acceleration in reduced time is possible only with hydraulics. But now, all these records are owned by Kingda Ka located at Six Flags Great Adventure in Jackson, New Jersey. Kingda Ka is a 456-foot tall roller coaster with a speed of 128mph. How hydraulics work in Top Thrill Dragster? Hydraulics has a wide range of applications. But did you ever thought that you might see one among it in amusement parks? Recently we have many amusement rides that work using hydraulic launch. Roller coasters with hydraulic launch will provide high acceleration in a short period and comfortable experience for riders. The hydraulic launch contains two identical cylinders with each carrying 16 hydraulic motors for producing power. For every motor, there will be a separate hydraulic pump. The accumulator is separated using a piston into two compartments. One compartment will contain hydraulic fluids(Wet Compartment) and is connected with the hydraulic system. The next compartment(dry Compartment) contains pressurized nitrogen gases and is attached with gas bottles containing nitrogen. Each of the 32 hydraulic pumps will push hydraulic fluid into the wet compartment. Due to this, the nitrogen gas inside the dry compartment will be forced out towards the gas bottle. As a result, the nitrogen present in the gas bottle will become pressurized. An electrical signal is required for launching the system. This signal will open the valve and push fluid towards the hydraulic motors. Hydraulic lap bars are another hydraulic application in Top Thrill Dragster for ensuring the safety of riders. The clamp-down lap bar operated using hydraulic cylinder will firmly lock the rider. Only the hydraulic power can raise or lower this lap bar.